As children, all of us shared great delight in covering our tiny paws with various colored pigments to create fridge bound masterpieces. As you grow and develop into an artist, you're taught to pick up a brush, pencil or charcoal stick, and a whole world of mark-making opens up. Today, creating works of art is a single tap away with some mind-blowing iPad and iPhone art apps such as Brushes, ArtRage, SketchBook Pro and Penultimate, but for many artists, reverting to using a finger to paint is a huge step backwards. We figured that it was time to recognize that for some iPad owners, an iPad stylus is a vital part of their iOS experience. Great product design is about creating something instinctive and intuitive to use, so that it quickly becomes a natural extension of a person. 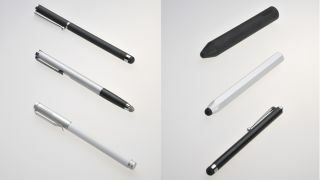 In the case of a stylus, the basic requirements are a pen-like handle and tip, but take a look at some like the AluPen and you see that both have aimed to tap into the artist's experience, evoking the familiar by emulating their real-world art tools. Art apps make the perfect testing ground for putting these iPad styluses through their paces. You're more likely to spend prolonged periods of time holding a stylus when taking your iPad to a life-drawing session or for some plein-air painting. Kensington marries two worlds in style with the Virtuoso Touch. Its slim profile, satin textured body and clipped lid work together to create a comfortable, assured feel. And the rubber tip, while not the most stable, is sufficiently pressure-sensitive for diagramming. Pop the lid to reveal a handy metallic ball point for when touchscreen just isn't liberating enough. The aluminium body of the TruGlide Pro resembles a regular pen, rocks a classic pocket clip, and feels well balanced when gripped. But it's the bulbous mesh tip that sets this stylus apart. It's made of fine microfibre strands that compress against the touchscreen and allow for beautifully controlled movement. A paintbrush-like replacement tip is also available for that uniquely artistic flourish. Wacom clearly took notes from the humble pen in designing the Bamboo Stylus Solo, a beautifully weighted device with an elegant satin-texture metal casing. A silver detachable lid with classic breast-pocket clip fits firmly on both ends for a traditional scholarly feel, while its removable 6mm tip combines fine-edge finesse with agile responsiveness. Whether notetaking or drawing, the Solo is a pleasure to use. Don't be put off by the astronomical dimensions of Studio Neat's rubber-grip stylus. The Cosmonaut is great for scribbling and sketching, plus it's perfectly weighted for both small and large hands, though its exactness may prove wanting. However, what it lacks in fine-grained precision it makes up for in robustness, with a bulbous tip that might well outlive the device it daubs. The stubby yet comfortable to hold Alupen is reminiscent of a crayon, and maintains a similarly balanced weight thanks to its rubber core and aluminium casing, which prevents rolling due to its hexagonal shape. Controlling the glide of the bubble tip across a touchscreen is a breeze, but those seeking finegrained sensitivity for line art drawing should perhaps opt for a slimmer profile pen. MediaDevil has designed this affordable stylus with iOS devices specifically in mind, as evinced by a detachable lanyard that plugs into the headphone socket to keep it secure (though we found its presence irksome when drawing). The diameter and weight of the clipped pen makes it extremely comfortable to use, and the fine rubberised tip is arguably the most responsive of the styluses we tested.